From April 1993: Another launch issue from Dark Horse's short-lived colonisation project... Which came to a shuddering halt with the realisation that the industry grass was no greener on this side of the Atlantic. TOTAL CARNAGE was, as the name and line-up suggests, pitched at an older readership. One that presumably frequented the local video library on a regular basis. 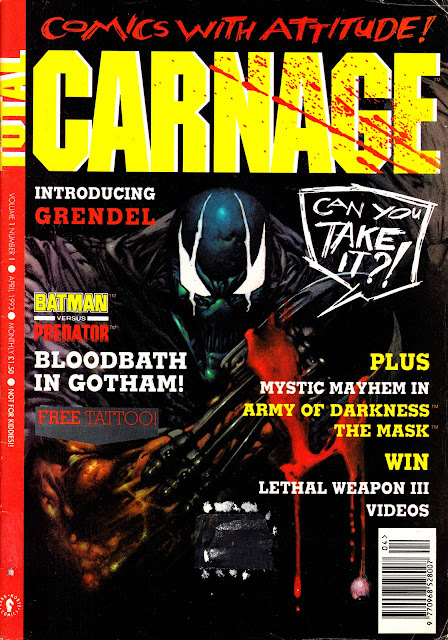 For me the big draw here is the first intercompany smack down between BATMAN and PREDATOR although, curiously, the editor favoured the unknown in the British newsagents Grendel as the launch issue cover star. Maybe the new-to-market DHI were skittish about crossing legal paths with Fleetway, publishers of DC reprints in the UK. Other strips included the pre-movie MASK and the post-movie ARMY OF DARKNESS. another lost relic unearthed and re-discovered, thanks slow ! that reprint of MARVEL FRONTIER is one to look forward to . Wouldn't it also be nice if they reprinted material from OVERKILL and other uk titles of the 90's ? I must admit I found the REVOLUTIONARY WAR a bit anti-climatic after the build up in your blog. And i think its notable that there hasn't been any follow-up or sequel although some of the players have appeared since in other marvel titles. For example, death's head has popped up in iron man and there have been references to mys-tech in recent issues of SHIELD.